Alone with her younger siblings, Sarah is exhausted but finally at peace. Then she nearly runs over a small Hispanic boy with her buggy...and somehow finds herself sheltering two more orphans. Paul Byler moved to Cody's Creek to help his brother in a time of need. But now that Joseph has recovered from his heart attack, Paul's ready for a quiet place of his own. The only problem? His new property lands him next door to the orphaned Yoder family—and a calling from God he can't seem to ignore. 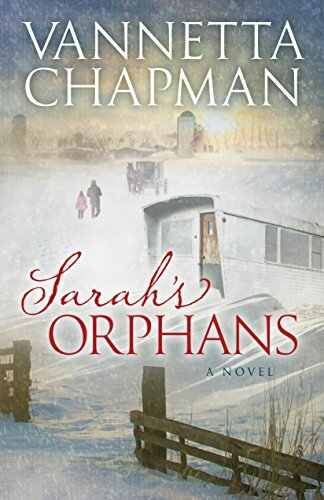 A story of extraordinary grace and love in the face of desperate need, Sarah's Orphans is the third standalone novel in the Plain and Simple Miracles collection by Vannetta Chapman. Vannetta Chapman's third book in this series Plain and Simple Miracles, Sarah's Orphan's, was a delight to read. I felt so much apart of this family with the detailed descriptions of their family life, farmhouse, and the surrounding countryside. Needless to say this book drew me right in. So many wonderful charactors come out in this story it was hard picking just one that I loved. The main character in this book Sarah shines through with her love for everyone that comes into her path. She is not afraid to commit and overcome any obstacles needed to help them. Grandma though to me saves the day. She listens to what the Lord tells her to do without thinking a second thought. She is a lifesaver, mentor. and a calm in the middle of a storm. There were some great twists in Sarah's Orphan's and my emotions ran high with this book, I got upset, cried pitifully, was scared, and laughed all in one book! I was basically happy yet an emotional wreck reading this book. Each book in this series connects in a small way but stands on their own.